Using Lida’s restrictions as well as her taste for chocolate and coconut, we turned to these airy yet chewy, gluten-free cookies. Getting rid of ingredients from butter to flour to egg yolks rends these quite minimalist, though they don’t taste it. I first came across the recipe in Shape magazine last holiday season. Shape is not ordinarily a place I go to for cookie recipes, but since they were modified from a recipe by chocolatier Payard, I gave them a go. For Lida, I modified the flavors some, but the macaroon-like chocolate-sugar-egg white base is all Payard’s. *Note: you can also make these simply with 2 1/4 cups powdered sugar instead of granulated sugar + cornstarch. I couldn’t find confirmation on my powdered sugar box that it really was gluten free, so I played it safe. Preheat the oven to 325°F. Spread the walnuts on a baking sheet and bake them for two minutes. Add the almonds to the tray and bake for 3-4 minutes more until the nuts are fragrant and just barely golden. Transfer to a bowl to cool. When cool enough to handle, break the walnut halves unevenly into smaller pieces. Spread the coconut on the baking sheet and toast it for 3-4 minutes until slightly golden. Add it to the bowl of nuts. Combine the sugar and cornstarch in a blender. Process on high speed for several minutes until the mixture is quite flaky and no longer very gritty. Transfer the sugar to a large bowl. Whisk in the cocoa powder and the salt, then add the walnut-almond-coconut mixture and the chocolate chips if using and stir to combine. Add the egg whites and stir just enough to moisten all the dry ingredients. 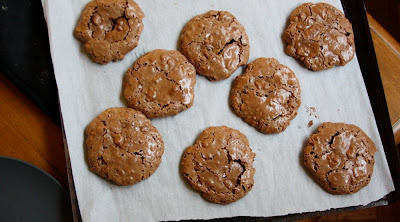 Spoon about two tablespoons of batter onto a parchment-lined baking sheet in a circle, leaving several inches between cookies as these spread a lot. Bake for 12-14 minutes, turning the baking sheet once. The cookies will spread and puff up and become slightly crusty and crackled. Cool on a baking sheet. Why Are My Cookies So Thick? These sound delicious! Do they have a similar texture to traditional meringues because of the egg whites, or are they a sturdier cookie? I can't wait to try them. These look sooo good, the crunchy-looking cracks, the chocolate, yummers! Everyone at work loved them! I make these every year for Passover and they're always a huge hit! I just made these cookies and WOW are they good!!!! Kudos to the creator of this recipe!!!! They are so delicious and the texture is great! I didn’t have any shredded coconut on hand, so I used just a dash of coconut extract instead and it did the trick! The only thing I would change about this is the sugar content. I used the equivalent amount of sweetener (Truvia) and they were just a little sweeter than I would like. But honestly, they’re fine just the way they are and are absolutely marvelous! One person who tried them said that these cookies are now on their list of best baked goods they’ve ever had!! !